The clock shatters the peace of the quiet, early morning. It is 4:00 and dark. The wind is howling. You want to snuggle deeper under the blankets. But you dutifully crawl out of your warm, cozy bed onto the cold floor and quickly get dressed. Grabbing a bite, you are out the door. No. You aren’t the milkman going to work in the wee hours of the morning. You are 8 or 9 years old. Some are as young as 4 or 5. You are newspaper boys, on your way to pick up the merchandise you will deliver. As you reach the drop off site of the bundled papers dropped off in the wee hours of the morning by delivery trucks, you don’t have time to think about how cold it is. It is your job to cut the wire or twine holding the bundles together, roll them into deliverable bundles, stuff them in your large bags, get on your bikes and start delivering. When snow and ice prohibit the use of bikes, you walk or use sleds. 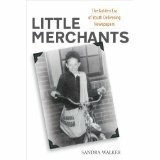 You are little merchants, as Sandra Walker calls them in her wonderful book, “Little Merchants, the Golden Era of Youth Delivering Newspapers”. To tell their story, Sandra has interviewed hundreds of people who in their aging years have relayed their stories to her – stories about young boys, and yes even some young girls, who got up at 4 or 6 in the morning to collect their newspapers, roll them up, get on their bikes to deliver them to 100, 150 or more people every morning. Then they would hurry home, get dressed and get to school on time. In the afternoon, the routine would start over again, often completing their routes in the dark. Sundays, the loads on their shoulders and on bikes doubled with all the Sunday paper inserts. Rain or shine, snow or sleet, ice or high winds, these young boys never missed a day. It wasn’t just the natural elements they braved, but dogs who barked, attacked and bit, sometimes grabbing a chunk out of legs and even backsides. They persevered and treasured the pennies, nickels and dimes they received. This allowed them to get in to see the cinemas, or buy a new bike or even fishing gear. Often, it was to help their families as they struggled through the depression and other hard times. Their customers were patrons in bars and saloons, in town and suburban residents who expected to have their paper by 6 in the morning and complained when it didn’t arrive. They rode their bikes miles to complete their routes. Nothing kept them from their jobs except serious injuries. Even dog bites only slowed them for a short while. They were rarely sick, and when they were, they did not let it interfere with their route. There were no sick days. When early 19th century activists tried to legislate them out of business, they found a way to continue anyway. Having that paper route was that important to them. From the east coast to the west coast – from the southern states to Alaska, these young entrepreneurs couldn’t wait to have their own route. And would do almost anything to keep it. It is a fascinating and wonderful book. These kids met life where it was. They willingly gave up comforts which we would consider necessities to earn that money – and fought to be able to do so. From these early life experiences grew individuals who were resilient, independent and industrious. They got good grades in school and even participated in after-school sports. They learned early in life what it takes to overcome and persevere, and did it without grumbling, complaining or giving up. We could all learn important life lessons from them.